Solano County has long been a place where its inhabitants give back to their communities. But it could be argued that among the special people who have given the most for the longest time, Lee and Virginia Kloppenburg can be counted. That is why the NorthBay Guild is nominating them for a Tribute to Seniors honor. 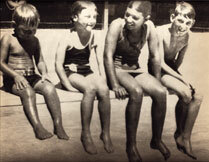 A very young Virginia is the second swimmer from the left in the lineup. Listening to the story of Virginia’s life is like opening a history book about Vacaville and Solano County. She proudly traces her lineage all the way back to Juan Felipe Peña, one of the founding fathers of the area. With her lively, intelligent eyes, ready smile and legendary no-nonsense demeanor, Virginia reflects on her growing up years in Vacaville. The Kloppenburgs, who married in 1954, opened a second-hand store in Vacaville with their name on the shingle. Not knowing anything about the business, but eager to learn and filled with ambition and energy, they would purchase their wares at an auction house in San Francisco and bring them back to sell. The shop first featured everything from flapper dresses to furnishings and art, all mainly from the 1920s. As their business began to thrive, so did the Kloppenburgs’ determination to leave their community a little better than they found it. Their volunteer work included participation in Fiesta Days, helping with Vacaville’s annual parade, and of course, many years of helping NorthBay’s Guild. For now, the Kloppenburgs are taking time out. Lee has had a series of health problems and Virginia is taking care of him in their beautiful 1903 Buck Avenue home, which is filled with antique furniture, ornately framed family pictures, music boxes and many other treasures they either traded or purchased over the years. SIDEBAR QUOTE NorthBay Hospital Guild nominated Lee and Virginia Kloppenburg for Vacaville’s Tribute to Seniors award. The Kloppenburgs will be among a number of local seniors being honored by the city on Oct. 7, 2009, at the Vacaville Performing Arts Theater. What follows is the Guild’s nomination. Cardiologist Dr. Milind Dhond will be the featured speaker at Vacaville’s 13th Annual Tribute to Seniors celebration. The annual event puts a spotlight on the accomplishments and contributions of local seniors in the community. Admission is free for the celebration, which will run from 9 a.m. to 2 p.m. Wednesday, Oct. 7, at the Ulatis Community Center. Dr. Dhond will speak at 11 a.m. on the latest technologies for peripheral arterial disease. In addition to Dr. Dhond’s medical presentation, there will also be a business expo, geared toward seniors, a fashion show and entertainment. Health information and a nonprofit resources table are also planned. Free flu shots will be offered to the first 200 visitors to the NorthBay Healthcare booth starting at 10 a.m. Among the seniors being honored for outstanding achievement at this year’s event are NorthBay Guild volunteers Lee and Virginia Kloppenburg. Volunteers like the Kloppenburgs make all the difference to a community. Thank You!